As you spend time and resources to develop new channels of customer acquisition, here's a something to ponder—out of every 100 people who download your app, 86 of them never open it again. The message is clear: spend time acquiring new customers, but don’t forget to also spend time nurturing them. In fact, if your retention rate improves by just 5%, your profits will increase by 25-90%. When it comes to retention messaging, email is still your best bet. According to eMarketer, email marketing dominates with the highest ROI of 122%, which is over four times higher than that of social, paid search, and direct mail. A well-crafted email is an opportunity to win back those customers who got your product and then got busy with life. Retention emails come in many shapes and forms. We previously showed you some examples of the various kinds. To up your retention email game even further, I scoured my inbox and the web to find the best kinds of customer retention emails that inspire engagement. Let's take a look at what makes these emails so effective and how you can apply their lessons in your own retention efforts. Every app has core features that make it valuable. Your onboarding process focuses on these. And then, there are peripheral features. These empower users do more with your product. The more app features customers use, the less likely they are to migrate to another service. But how do you ensure customers discover these less-obvious features of your app? 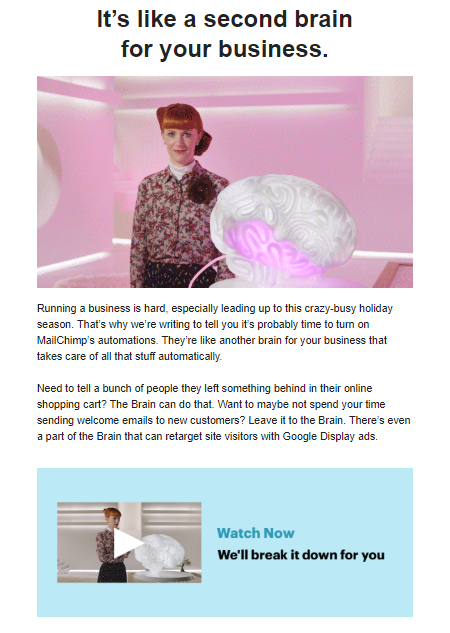 The above email from Mailchimp is a perfect “later customer education” example. At its core, Mailchimp makes bulk emailing easy, but its automation features could be a lifesaver for customers and make the app indispensable to them. Finally, lets come to the last bit of the email: the video. Why did Mailchimp add a video, instead of simply a link to the feature? To understand this, let's look at a diagram from the Intercom blog. 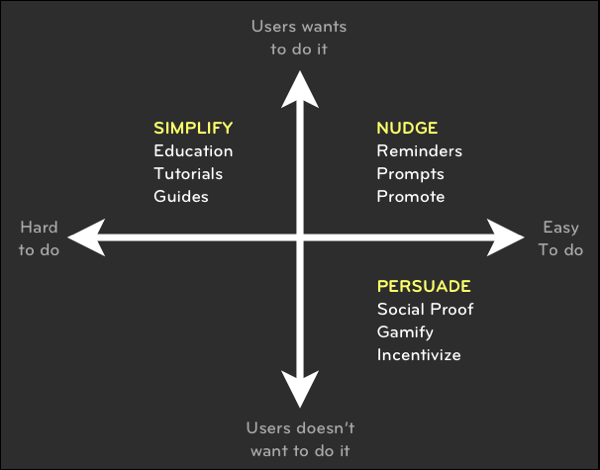 It plots how to convince customers to take action, based on two criteria of the action itself: the action’s ease and the user’s desire to perform this action. Where do you think Mailchimp’s marketing automation feature falls? It's clearly something customers want to do, but at the same time, it's also hard. In this case, you should simplify the task for users. So, Mailchimp’s simple video breakdown of automation is the perfect way to get users to try it. Takeaway: Make sure your “later education” empowers users by showing them the “cooler things” your product can do. Abandoned cart emails are the most commonly sent retention emails. After all, an alarming 69% of online shoppers leave their carts midway. This isn’t a problem for e-commerce companies alone. Even in B2B, there are several actions customers don't complete—uploading files, adding teammates, or updating profiles. There's good news though: cart abandonment emails do save the day. About one in five of these emails are opened, and half of the opened emails lead to a purchase. 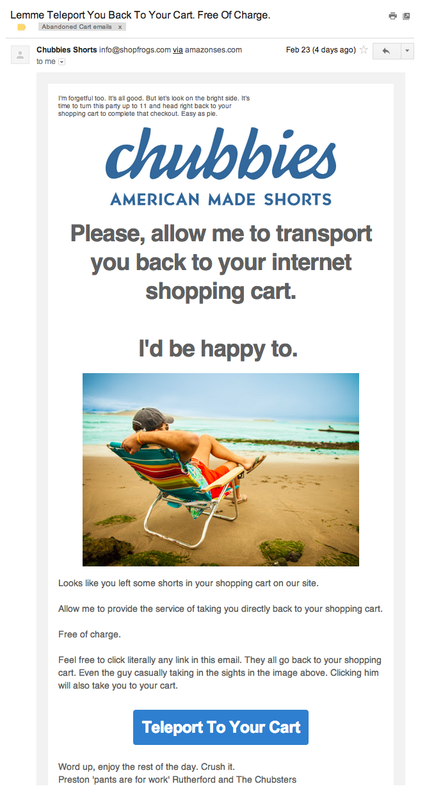 This email from Chubbies was by far the coolest cart abandonment email I found in my inbox. Instead of being reminded you left something in your cart, you’re being “teleported” to it. And, while the shopping cart is referenced about four times, it never comes across as annoying or over-the-top. Lastly, the email takes the concept of a single call-to-action to another level by adding not one, but three links—all to the shopping cart. Takeaway: Infuse a bit of personality in your emails, even if it's just to remind customers of their shopping cart. Despite the many forms Quora takes, its core offering remains content. Content draws users to the platform, and in turn, encourages creators and advertisers to spend time and money on it. 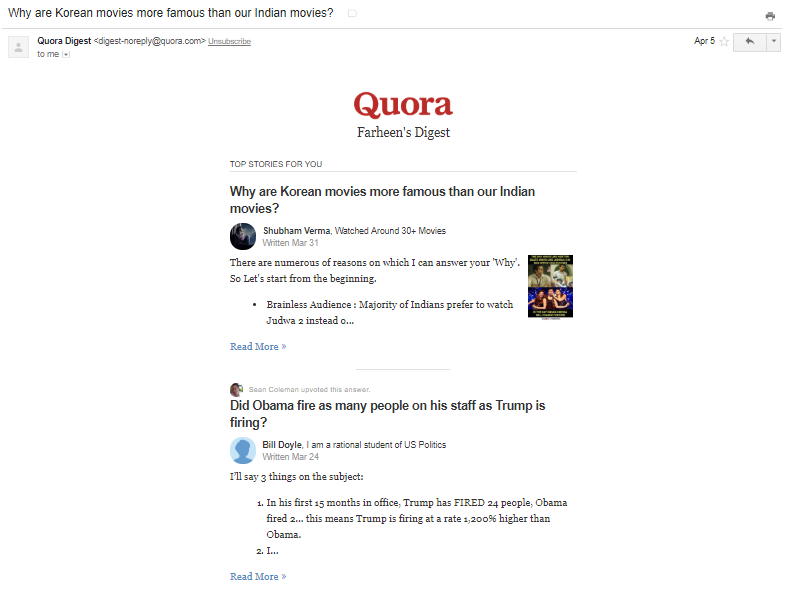 Content digests are hardly a revolutionary idea, but this is what sets apart Quora’s daily digest email: it’s my daily digest, curated specially for me. Like a number of other social media platforms, Quora looks to form a regular product habit in its users. It's daily digest emails are the first step or the “trigger” in this process, as Nir Eyal, author of Hooked, calls it. In order to make its trigger enticing, Quora harnesses every scrap of information it has on its users: people they follow, topics they follow, and answers they upvote. This layer of personalization separates its content digest from countless other newsletters and roundups. Takeaway: Be sure to note your audience's preferences when looking to personalize your messaging. When done right, promotional emails help you rack up paid memberships. When done wrong? They make emails marked as spam and your brand seen as annoying. Grammarly’s email is a lesson in crafting the perfect promotional offer. The email copy is crisp, and lets the call-to-action grab the spotlight. What really takes the cake in this email is the use of the GIF. The image explains all that Grammarly helps you do in a matter of seconds! How many times have you been tempted to rattle off the features of your app, when a visual could convey just as much or more? The next time you’re writing a promotional email draft, do consider this question. Takeaway: Where relevant, use visuals to elevate a promotional email (if file sizes permit). It can feel disheartening when a free trial customer leaves your product, especially when you think of all the resources you spent on acquiring them. In fact, data shows that only about 15-20% of free trial customers end up becoming paying users. Still, expiring trial emails are worth trying to save those potential customers. This email from Zapier gets my vote for its simplicity and honesty. The biggest selling point of this email is that it acknowledges that most free trial users never actually “try the product out”. Most people start a trial and forget, and before they know it, two weeks are up. Does that mean you should offer longer trials? Not necessarily. But, Zapier’s offer to extend my trial is effective here, because it ensures that any users that still want to try out the product don’t fall through the cracks. Finally, the copy doesn't waste time reminding me about all the features I’ll lose access to once the trail ends. What’s more, it goes a step further to tell me what I can still accomplish with a free plan. Takeaway: If you understand your free trial user’s habits, gestures like trial extensions can make a big difference to your conversion rate. The progress email is one of the best types of retention emails. It doesn't come across as spam, reminds the user that you exist, and coaxes them to come back. 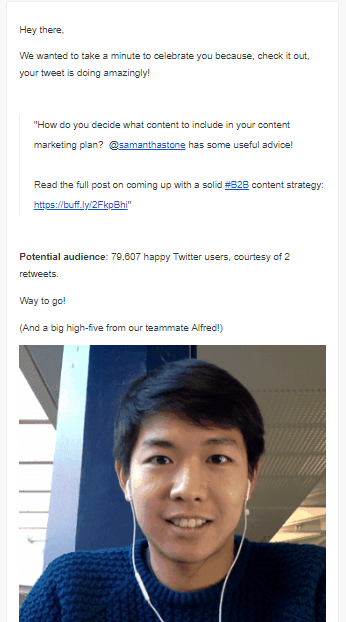 Buffer’s growth product manager Maxime Berthelot shares they have two major ways to bring users back: emailing users when their queue becomes empty and emailing them with their latest post analytics. “The first nudges them to come back to fill their queue while the second encourages them to schedule more posts,” he says. The subject line “Lookit! Your tweet is taking off” promises good things to come. As with most progress emails, this one doesn't launch into stats immediately. Instead, it celebrates the performance of my tweet, boosting my sense of achievement. The stats at the end just further pique interest. Takeaway: Harness your users’ data to prepare custom and personalized reports for your customers. Open any spam folder and you're sure to find one specific type of email: deals and offers. Why do these emails land up here? Mostly because they are generic and way more frequent than customers would like. Is there a way to avoid this? Amazon is known for its legendary customer experience and its emails don't disappoint either. Imagine stepping into a store and being handed a lucrative discount on the very items you've come to buy. 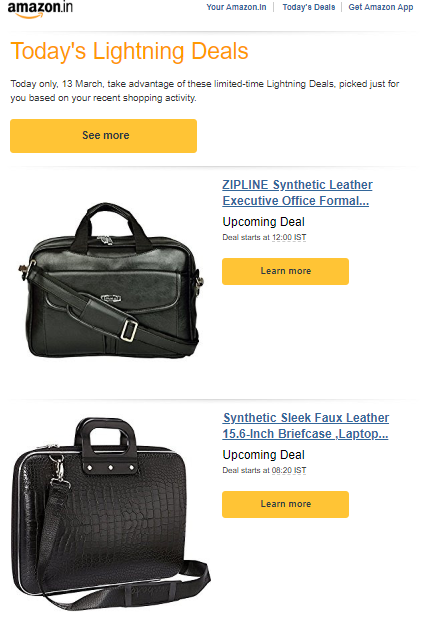 Amazon’s emails are like that. Amazon meticulously tracks every action you take on the website/app—on-site behaviour, browsing history, past orders, location, and a lot more. This data is then used to send a series of related product emails, upcoming deals, product bundles, and event-specific deals—all unique to your preferences and browsing history. Notice how the buttons don’t ask me to “Buy Now”. It simply asks me to “Learn more”, which is much less commitment. There's also a focus on just two upcoming deals related to products I want. Takeaway: The more personalized the content is in your email, the more likely it will prompt action. As your developers work hard to ship new features, it's exciting to share the news with customers. Only, your customers will rarely share your enthusiasm. So, how do you make them not only care about product updates but also try them out? Helpdesk software Groove came up with a solution after several false starts. When they released a new feature, along with an in-app message and an update on their blog, they made it a point to email every customer who had ever requested the feature with a personal follow-up. The results were astounding. They saw a 68% response rate, not just open rate, and some of their emails even brought back churned customers. Compare this to the measly 10% open rates their previous emails got. This is the magic of personal follow up. Takeaway: When feature requests come in, be sure to take notes and create email lists off of these requests. A good retention email checks the following boxes: the right message, the perfect time, and a single CTA. Great retention emails take this a step further with entertaining copy, layers of personalisation, and empathy for users. Before you hit send on your next batch of retention emails, think about this: which category do your emails fall into?